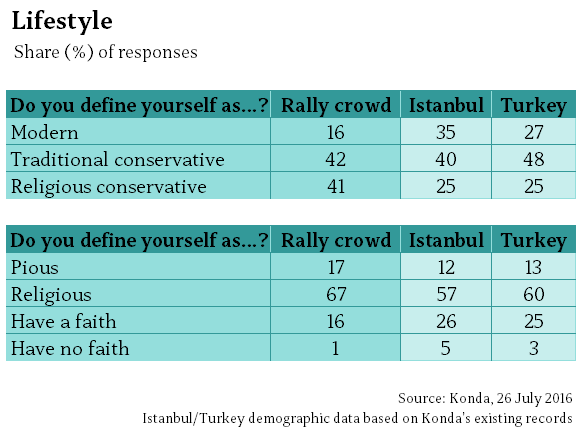 Konda, perhaps Turkey’s most reputable pollster, has this afternoon published the results of a fascinating public survey it conducted with anti-coup protesters on the streets of Istanbul on 26 July, eleven days after the failed coup attempt. It’s fascinating because it reveals much about the type of people who heeded President Erdoğan’s call to take to the streets and guard them against a potential second military intervention. The results reveal a crowd that is overwhelmingly pious, ethnically Turkish, aged in their thirties and supportive of the government – disproportionately so when compared to Istanbul and Turkey as a whole. It is a stark contrast to the picture of political and social unity trumpeted by the government and the vast majority of the Turkish media. Konda spoke to 1875 people face-to-face between 9pm and midnight on Tuesday 26 July at three Istanbul locations were so-called “Guarding Democracy” rallies were called: Taksim and Saraçhane on the European side, and Kısıklı on the Asian side. The findings – which are worth a full look if you speak Turkish – point to a demographic that is largely associated with the governing Justice and Development (AK) Party. Four-fifths of rally participants defined themselves as conservative (as opposed to “modern”) and religiously observant, well above the citywide and nationwide proportions. A crushing 79.5% said they voted AK at the last election on 1 November 2015, while 84.1% said they would vote AK if there was an election that day. AK’s share of the vote in Istanbul last time around was 48.7%. 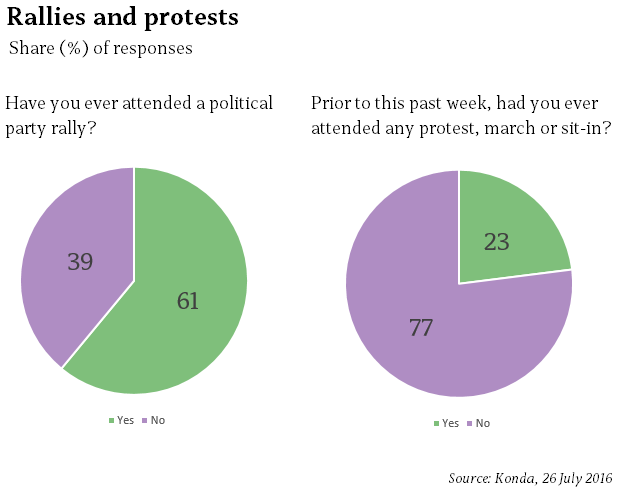 Huge majorities told Konda that they had attended political party rallies before, but that this was the first time they had attended a mass protest. The crowds were youthful and educated above the national average: 59% had a high school or university diploma. More than half said they got their news from atv – a private channel with a strong pro-government bias – and its sister network, A Haber. The proportion saying their source of news was atv, A Haber or the state-run TRT was 70%. There is an important caveat to make: these results represent the people who spoke to Konda at three public squares on 26 July. They are not necessarily a proportional representation of rally participants on that day, nor do they necessarily represent the views of people who attended rallies on other days. And, of course, these findings do not mean that people outside the AK Party voter demographic are in any way supportive of military coups. But Konda’s findings are still useful for two reasons. First, they show us Turkey’s pro-democracy rallies do not span the political spectrum as extensively as the government claims they do. But that does not mean the rallies are insignificant. After all, tens of thousands have taken to the streets every night for most of the past month. Second, Kemal Kılıçdaroğlu – leader of the main opposition CHP – had a change of heart about attending last Sunday’s mass rally in Istanbul. After consulting party colleagues, he said he saw his proposed speaking slot at the rally as an “opportunity” to address a section of the electorate that rarely supports him. He used his speech to list a 12-point manifesto for Turkey’s future. If Sunday’s participants were anything like those Konda interviewed on 26 July, they will have been a demographic that will have never heard the CHP leader speak. It may prove to be a very shrewd move.